We thought we’d take a minute to introduce ourselves. We are Lauren and Michael, co-creators and owners of Salt at Shoal Bay. We have three young daughters, Lillian (7), Evelyn (5) and Claudia (1). Over the last decade we have designed, built and renovated five homes. Salt is our most recent and by far our biggest project to date. 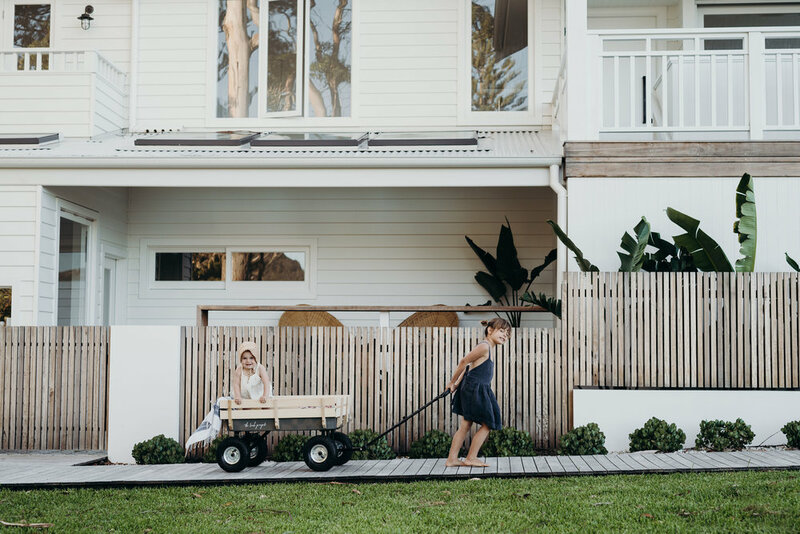 In between juggling family life, we manage the day-to-day operations at Salt with the help of our bookings team and managing agents to ensure your stays are extra special. We have been overwhelmed and humbled by the response in our first year and we’re excited to grow and evolve these spaces as the years go on. We hope to use this Journal for a bit of everything. We’ll be sharing some background stories about the build process, our renovating tricks and things we’ve learned along the way, our favourite products and suppliers, plus we’ll be sharing our local area tips for the best beaches, cafes, restaurants and more. We also love to travel! A big part of why we created Salt, was to give us the flexibility and freedom to travel more (but more on that later!). When we designed Salt, we wanted to create a space that was both ‘family friendly’ but without compromising on luxury and the overall experience. We love discovering other unique holiday properties who have done the same and we’ll be sharing some of our favourite travel finds here too. If there’s anything in particular you’d like to know about, feel free ask away in the comments section below and we’ll do our best to get back to you. So hello… we hope you enjoy following along!